Franklin's Fold-N-Go Golf Toss set is the easiest way to play ladder golf. The fully collapsible ladder golf targets make setting up, breaking down, carrying and storing a breeze. Whether you're tailgating between college campuses and professional stadiums or spending quality time at the cabin or the beach, Franklin's Fold-N-Go Golf Toss lets you bring everyone's favorite outdoor game along. 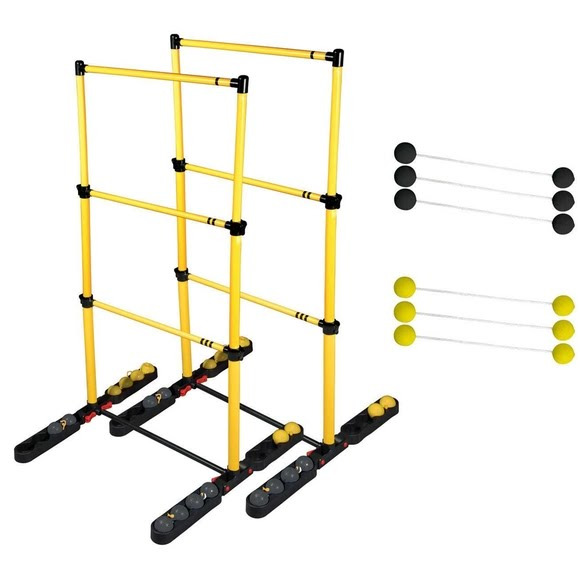 Franklin&apos;s Fold-N-Go Golf Toss set is the easiest way to play ladder golf. The fully collapsible ladder golf targets make setting up, breaking down, carrying and storing a breeze. Whether you&apos;re tailgating between college campuses and professional stadiums or spending quality time at the cabin or the beach, Franklin&apos;s Fold-N-Go Golf Toss lets you bring everyone&apos;s favorite outdoor game along. Play one-on-one or with teams of two and never lose a golf toss as they are conveniently stored inside the foldable frame.